Annie's Nest is a 2 storey, 4 bedroom, 2 bathroom home which has everything you need to ensure a comfortable stay. Relax with a glass of wine on the wrap around deck and enjoy stunning water views across Matauwhi Bay. Take an easy 8 minute stroll into Russell township and beach. Situated well back off the road, this home not only offers privacy and serenity but it's elevated position and surrounding trees create a feeling of sanctuary. Enjoy the peace and quiet. Opening plan living with lounge, dining and kitchen having excellent indoor/outdoor flow. The fantastic modern kitchen is well equipped with all the modern conveniences. Upstairs you will find 3 bedrooms, a shower room, a bathroom with bath and vanity and a separate toilet. Downstairs you will find the 4th bedroom and semi en-suite bathroom, kitchen, dining and lounge complete with sofa bed. In colder weather you will be able to take advantage of the cosy Kent fire which is located centrally in the lounge/dining downstairs. BBQ located under covered deck. Plenty of parking available! Please note: the staircase is steep so may not be suitable for toddlers. The house is in a great location - about a 10-15 minute walk to town and a 5 minute drive to Long Beach. The beds are comfortable and have nice quality linens, and the kitchen and BBQ were well supplied. The layout of the house is good for a big group. Would stay there again if I was in Russell. well located hideaway about 12 mins walk from the town centre. Well fit out and supplied. This little gem is hidden from the road , surrounded by bush with a view of Matauwhi Bay from the upper floor and back deck. This cottage is well supplied i(kitchen, Laundry and bathrooms) for a very easy stay including a BBQ. Easily took 8 people in the 4 bedrooms. Parking for 3 cars. An easy 10-12 minute walk to the town centre, where there is lovely local shops, cafes, 4 Square, restaurants and bars. I would return to this bach without a doubt. We stayed in Annie's Nest in the weekend for a wedding. We stayed in Annie's Nest in the weekend for a wedding. 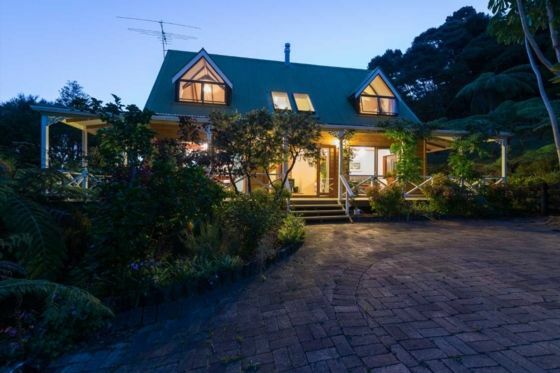 The house is excellent, just as in the photos, and is well situated about 15 minutes walk from Russell. The property manager, Tracey, was very accommodating and made us feel welcome. In short I would highly recommend this property. Loved the location and views from the deck. Loved the location and views from the deck. Upstairs bathroom is ideal for groups - 3 rooms - toilet, shower, bath and handbasin. Not too far from Russell centre, but too far to walk with 2 small children. The house had everything we needed and is a good size for 2 families with children.